Creating a Generic Repository pattern in an MVC3 application with Entity Framework is the last topic that we are about to cover in our journey of learning MVC. 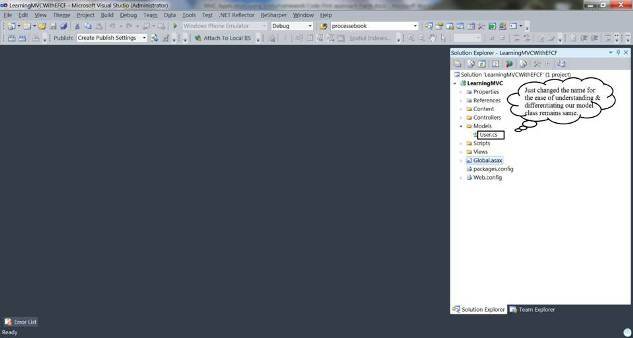 The article will focus on Unit of Work Pattern and Repository Pattern, and shows how to perform CRUD operations in an MVC application when there could be a possibility of creating more than one repository class. To overcome this possibility and overhead, we make a Generic Repository class for all other repositories and implement a Unit of Work pattern to provide abstraction. We have running sample application that we created in fifth part of the article series. 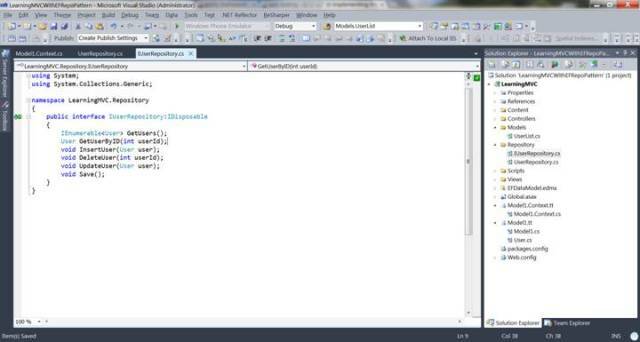 We have Entity Framework 4.1 package or DLL on our local file system. 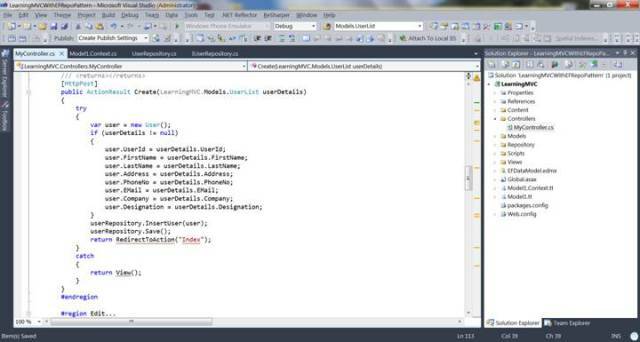 We understand how MVC application is created (follow second part of the series). We have already discussed what Repository Pattern is and why do we need Repository Pattern in our last article. We created a User Repository for performing CRUD operations, but think of the scenario where we need 10 such repositories. Are we going to create these classes? Not good, it results in a lot of redundant code. 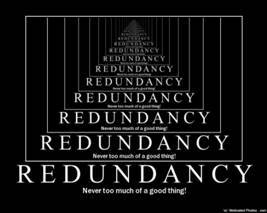 So to overcome this situation we’ll create a Generic Repository class that will be called by a property to create a new repository thus we do not result in lot of classes and also escape redundant code too. Moreover we save a lot of time that could be wasted creating those classes. From MSDN, The Unit of Work pattern isn’t necessarily something that you will explicitly build yourself, but the pattern shows up in almost every persistence tool. 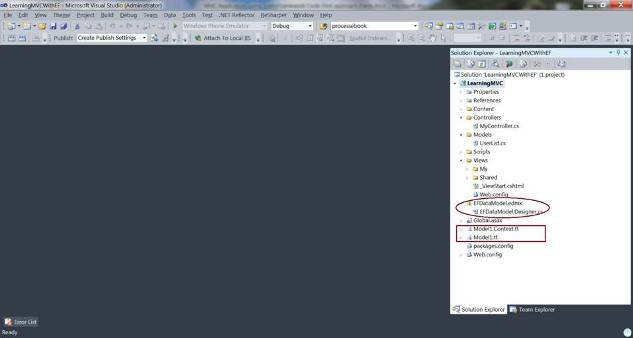 The ITransaction interface in NHibernate, the DataContextclass in LINQ to SQL, and the ObjectContext class in the Entity Framework are all examples of a Unit of Work. For that matter, the venerable DataSet can be used as a Unit of Work. The Unit of Work class can have methods to mark entities as modified, newly created, or deleted. 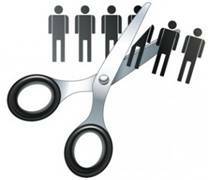 The Unit of Work will also have methods to commit or roll back all of the changes as well. Why use Unit of Work? Again Martin Fowler statements, “When you’re pulling data in and out of a database, it’s important to keep track of what you’ve changed; otherwise, that data won’t be written back into the database. Similarly you have to insert new objects you create and remove any objects you delete. You can change the database with each change to your object model, but this can lead to lots of very small database calls, which ends up being very slow. Furthermore it requires you to have a transaction open for the whole interaction, which is impractical if you have a business transaction that spans multiple requests. The situation is even worse if you need to keep track of the objects you’ve read so you can avoid inconsistent reads. You see I don’t have to concentrate much on theory, we already have great definitions existing, all we needed is to stack them in a correct format. One of the best ways to use the Unit of Work pattern is to allow disparate classes and services to take part in a single logical transaction. The key point here is that you want the disparate classes and services to remain ignorant of each other while being able to enlist in a single transaction. Traditionally, you’ve been able to do this by using transaction coordinators like MTS/COM+ or the newer System.Transactions namespace. Personally, I prefer using the Unit of Work pattern to allow unrelated classes and services to take part in a logical transaction because I think it makes the code more explicit, easier to understand, and simpler to unit test(From MSDN). 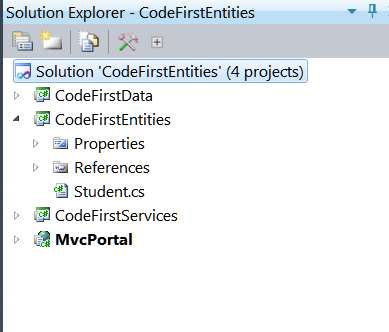 Step 1: Open up our existing MVC3 application created in Part5 in Visual Studio. 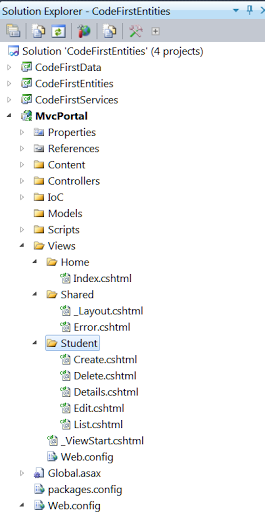 Step2: Right click Learning MVC project folder and create a folder named GenericRepository and add a class namedGenericRepository.cs to that folder. We can see, we have created the generic methods and the class as well is generic, when instantiating this class we can pass any model on which the class will work as a repository and serve the purpose. TEntity is any model/domain/entity class. MVCEntities is our DBContext as discussed in earlier parts. 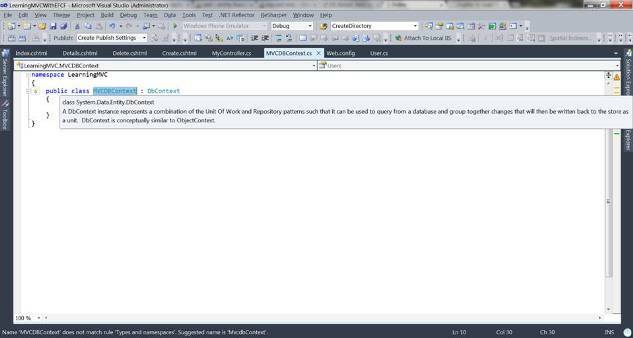 Step 3: Implementing UnitOfWork: Create a folder named UnitOfWork under LearningMVC project, and add a class UnitOfWork.cs to that folder. We see the class implements IDisposable interface for objects of this class to be disposed. We create object of DBContext in this class, note that earlier it was used to be passed in Repository class from a controller. Now it’s time to create our User Repository. We see in the code itself that, simply a variable named userRepositoryis declared as private GenericRepository userRepository; of type GenericRepository serving User entity to TEntity template. I.e., mere 6-7 lines of code. Guess what? Our UserRepository is created. You see it was as simple as that, you can create as many repositories you want by just creating simple properties, and no need to create separate classes. And now you can complete the rest of the story by yourself, confused???? Yes it’sDBOperations, let’s do it. Now this unitOfWork instance of UnitOfWork class holds all th repository properties,if we press “.” After it, it will show the repositories.So we can choose any of the repositories created and perform CRUD operations on them. unitOfWork.UserRepository.Get() -> Accessing Generic Get() method to get all users. Now, no need to write that constructor, in fact you can remove the UserRepository class and Interface we created in part 5 of Learning MVC. I hope you can write the Actions for rest of the CRUD operations as well. Note: Images are taken from Google images. We now know how to make generic repositories too, and perform CRUD operations using it. We have also learnt UnitOfWork pattern in detail. 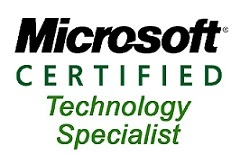 Now you are qualified and confident enough to apply these concepts in your enterprise applications. This was the last part of this MVC series, let me know if you feel to discuss any topic in particular or we can also start any other series as well. This is needless to explain how you’ll call repository inside the controller, as you now know how to treat our controller, but still let’s do it for once. 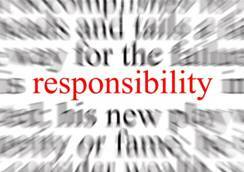 You want to improve the code’s maintainability and readability by separating business logic from data or service access logic. In our first three articles, we learnt a lot about MVC, starting from definition to use, from creating an application to connecting the MVC application with database using different techniques. In the very last part of the series, we learnt how to connect our MVC application with existing database using Entity Framework. 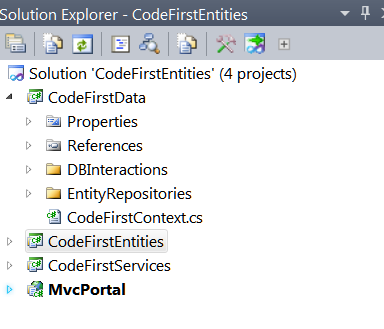 This article will focus on connecting our MVC application with database using CodeFirst approach, i.e., one of the features Microsoft’s Entity Framework provides. We have the running sample application that we created in the third part of the article series. We understand how MVC application is created. 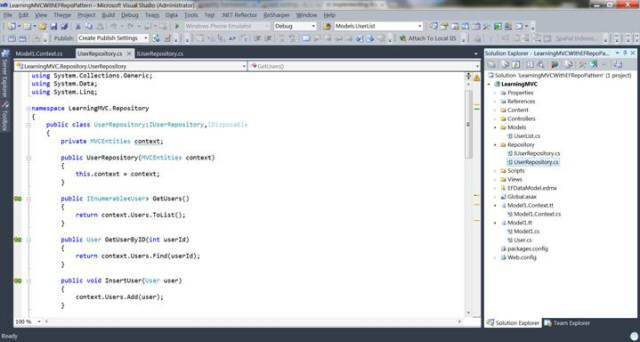 To achieve a domain driven design, Entity Framework introduced EF 4.1 Code First. In the Code First approach, we focus on the domain design or entities/POCO classes first and create classes as per our model requirement. We do not have the database of the application, rather we create database automatically from code after defining our domain. The database created perfectly matches with the domain we design, so we have to be very conscious and keen in designing our domain model. It feels exciting to see database created on the fly with the help of our entities and XML configuration, without even opening database server. 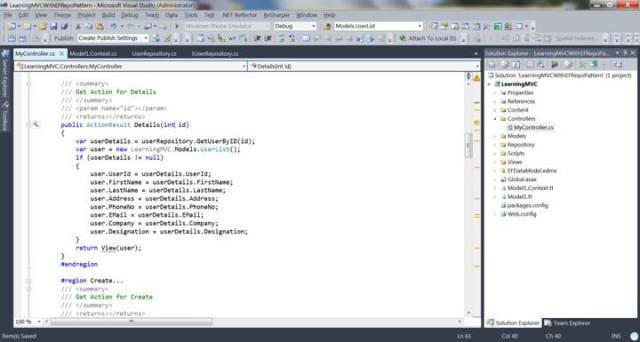 No matter, you are not an expert in database, if you are a C# developer, just focus on your model/class creation.EntityFramework will take headache of creating and managing database for you. 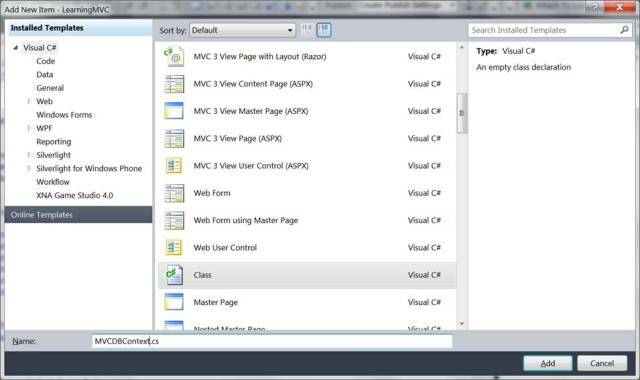 Step 1: Open the MVC application that we created in Learning MVC-Part3 in your Visual Studio. 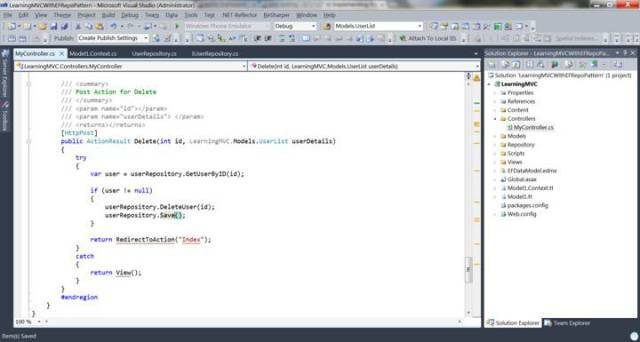 We can clearly see and remember what we used to connect our MVC application to database with the help of entity framework, yes it was edmx class and our Model.tt classes generated from edmx classes. Step 2: We don’t need the existing data-base, so you can delete the already created database for our part 3 application (if created). Our old solution had UserList class in Models folder, I have only changed the name of the class for differentiating it with previous application, and readability as was in the first part. 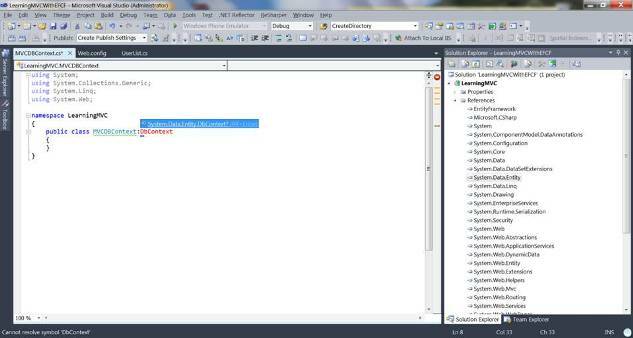 Step 5: Just add System.Data.Entity DLL as a reference to the solution if not already added. 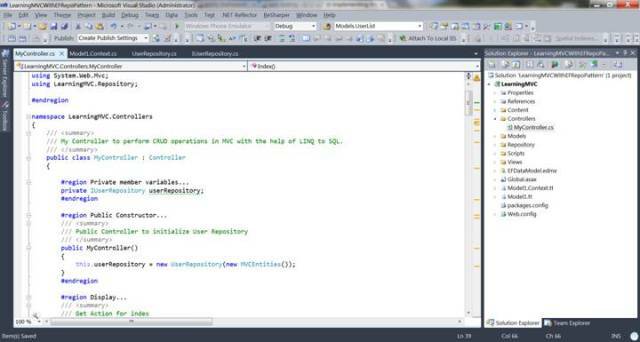 DbContext class: According to MSDN, DbContext class is conceptually similar to ObjectContext. 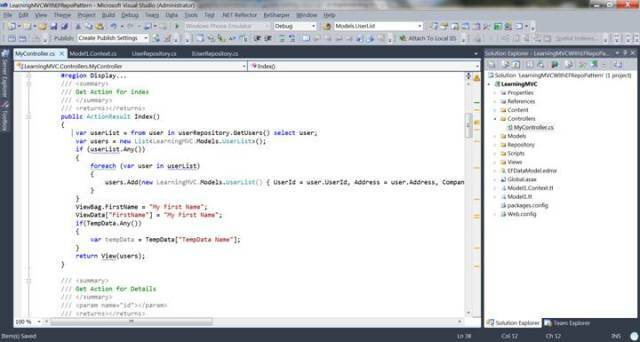 To define, theObjectContext class is the part of the core EF API in the Microsoft .NET Framework 4 and this is our hero class that allows us to perform queries, change tracking and update the database using the strongly typed classes that represent our model (entity class). The DbContext is a wrapper around ObjectContext that exposes the most commonly used features of ObjectContext as well as provides some simpler “shortcuts” to tasks that are frequently used but complicated to code directly with ObjectContext. Simplfied alternative to ObjectContext and is the primary object for interacting with a database using a specific model. That’s it, our 90% work is done? DbSet property: It is a simplified alternative to ObjectSet and is used to perform CRUD operations against a specific type from the model. By default, the name of the DbContext class will be the name our database that will automatically be created, so be wise to select the name of context class, else it could be handled in web.config as well. 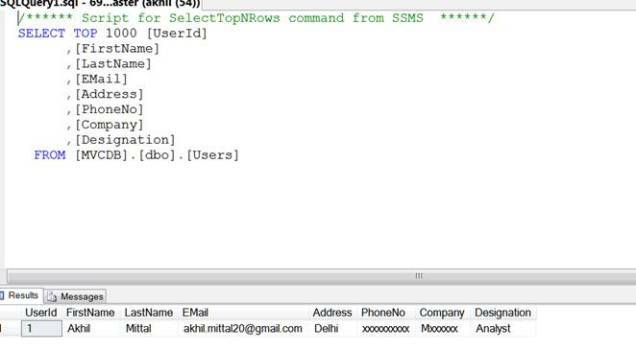 The name of model will be the name of Table in database and properties of model will be the columns of the table. 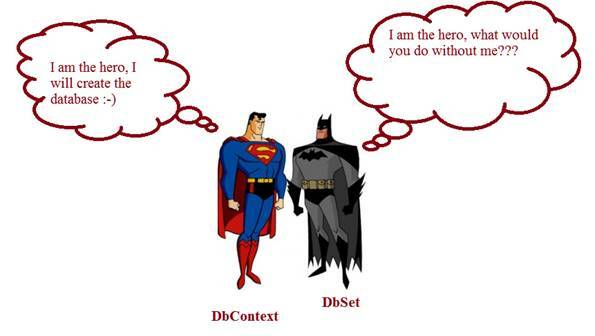 Both DbContext and DbSet are our super heroes, in creating and dealing with database operations, and make us far abstracted, providing ease of use to us. 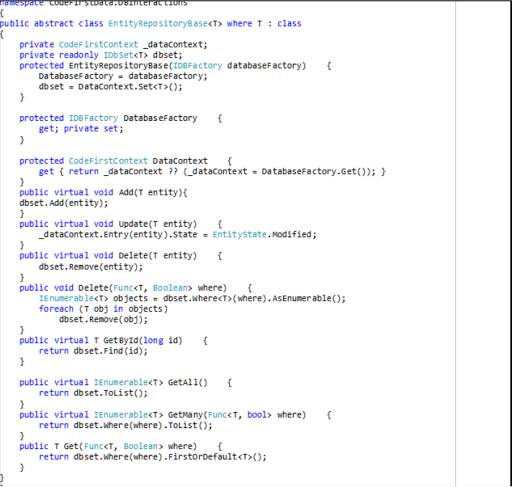 When we are working with DbContext, we are in real working with entity sets. DbSet represents a typed entity set that is used to perform create, read, update, and delete operations. We are not creating DbSet objects and using them indepedently. DbSet can be only used with DbContext. The name of the connection string will be the name of the DbContect that we defined, i.e., MVCDbContext. 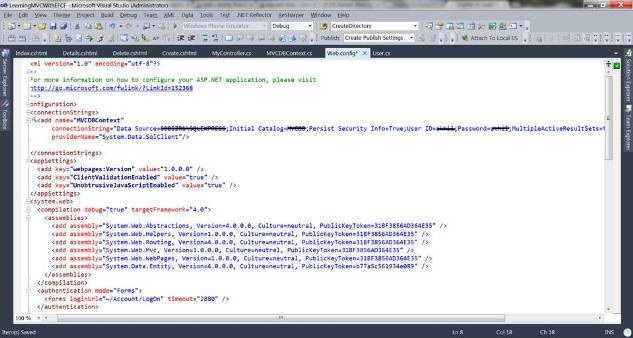 Step 9: Now, we just have to modify the access method in controllers, earlier, when we created application in third part, we were accessing the context class from the modelcontext class that was generated from edmx file. 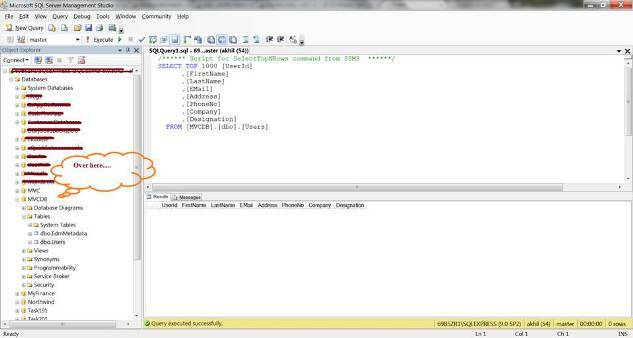 Edmx file was added having reference to already created database. We see our database is created, with the name MVCDB, that’s the magic of EntityFramework. 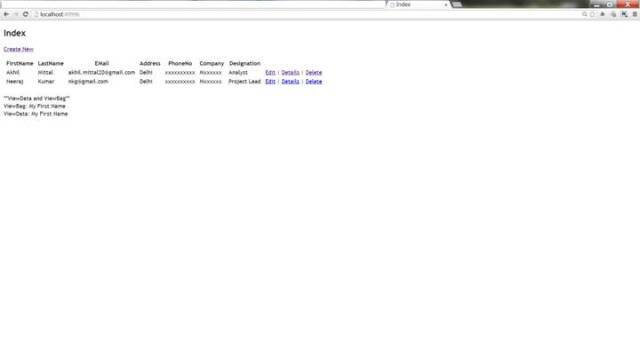 Now we can perform all the CRUD operations on this database, using our application. Just create a new user. In database we see, user created. By default, integer property with ID in its name of model will be the primary key in the database, in our caseUserId, or you can define the primary key in the model too. 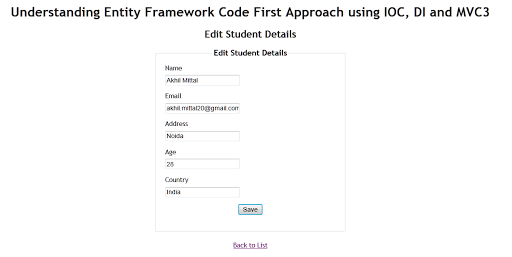 Now we know how to play with EntityFramework to create database as per our domain model from our code, we have already moved ahead to advanced concepts of MVC and Entity Framework. When we see the definition of DbContext, it uses the terms Repository Pattern and Unit of Work Pattern. We’ll discuss these more in detail in my next article.